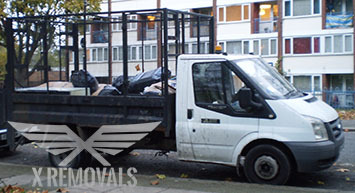 In addition to our very comprehensive moving services, we are glad to say you can count on us for highly efficient and reliable rubbish removal in London solutions that would perfectly cover you needs. No matter whether you choose to call us for waste collection in London as a separate service, or you would like to make use of the offer in order to optimize the preparation for your upcoming home/office relocation, count on us at a hundred percent. In order to enable them to do their job right, we have made sure they have access to lorries that are truly state of the art. Our modern trucks have fast loading equipment and have capacity enough to facilitate even the largest amounts of junk you need removed from your property. Naturally, the rubbish removal in London service we bring to your attention covers all the boroughs and districts of the capital. We have permissions to all London depots which means once our technicians collect the waste from your place, they will drive it to the nearest location where it can be properly disposed of. We have the policy of keeping our service as environment friendly as possible, which basically means we recycle as much of the junk we are entrusted with disposing of as manageable. Furthermore, all our drivers are trained in fuel saving driving techniques, which both decrease carbon emissions and make our rubbish removals in London service cheaper due to the reduction of resources necessary to its delivery. In short, if you want to get rid of any sort of junk and you want it to happen now, we are the right people to turn to. Book your waste collection on our flexible schedule and leave it to us to handle the job. One thing is certain and that is we are not going to disappoint you. Don’t forget that you can request a free quote upon contact, or ask for a viewing to be carried out so that the precise cost of your collection and disposal project can be estimated. The price you are told in advance is the price you will have to pay when the job is done, as simple as that – there will be no hidden costs and additional charges in the end. We cover the whole territory of London. Our nation’s capital is now home to over 10 million people who live in 32 boroughs (plus the City of London itself). London is also a thriving commercial hub thanks to the City and Canary Wharf, in addition to being one of the most popular tourist destinations in the world, especially in recent years.